If ever you plan to go there and try to climb atop the nation's second largest chunk of granite, make sure you are in good health, do not forget water and do not attempt to hike in the middle of the afternoon, especially if you are unaccustomed to dealing with something called humidity. Unless you are a seasoned experienced hiker, this rock has the potential of kicking your backside bigtime. If a hiker were to ever pass out on this thing, there is the potential to literally roll off the rock to an untidy death in the brambles below. Don't be fooled by the Ranger Station info that the trail to the summit is just 6/10ths of a mile. Heed instead the information that in that very short distance the elevation change is 426 feet. Dear Smokey the Bear: Here's some mustard, just eat me already. I have a love-hate relationship with hiking. I love to think about hiking. The commune with nature. The reaching of the ultimate goal. The feeling of accomplishment. It's all quite an intoxicating feeling. It's the actual hiking that I have a problem with. It's not that I hate hiking. I don't. I just hate certain parts of hiking. Like the pain part. And the fatigue part. And the way my legs hurt so much after a 12 mile hike that actually not having legs seems preferable. The fact that in the picture at right I either didn't know where the camera was or the photographer couldn't figure out that I wasn't facing the camera. Don't get me wrong it's all a lot of fun and I have a heck of a time going on these walks into forever with The Boy, who, after we walked the South Rim this weekend, had the best suggestion I'd heard all weekend: "You know those electric walkways they put in long terminals in airports?" he asked me. "They need to put one in up there on that mountain." The whole uncertainty of a hike is also a little bothersome. The wildlife aspect, I mean. I've heard people say that so-and-so was "lucky enough to see a mountain lion." Lucky enough? What kind of luck follows that person around, I wonder? My kind, actually, which is why I worry a lot about getting up close and personal with the inside of a bear's mouth. Or being able to count the notch marks on the teeth of a puma. Not appealing. Not appealing at all. If I'm going to see wildlife, I'd at least like it to have the decency to be dead on the side of the road. My living wildlife encounters I hope to be limited to trees and dirt and flowers and maybe an occasional prairie dog scurrying into his hole. As a somewhat seasoned hiker, with each walk I take I find myself a little more comfortable with my theory that if a mountain lion is going to pounce on me and The Boy, it will be on the front end of our hike. The part of the hike where we have yet to reach where it is we're going and have not yet begun the walk back. I just feel more comfortable hiking back than hiking out. And I at least have a 50-50 chance of being right with that theory since I have never seen a mountain lion either coming or going. I guess the only way for that theory to work, you would actually have to have two or more mountain lions sitting around in their mountain lion office with notes and a watch. "If we're going to eat up those Patterson boys," one would say glancing at the time, "we better do it now. They're still on the way up." On the other hand, there are a couple of points in a long hike up the side of a mountain -- any point during the ascent and the last couple of miles of the descent -- where you can become so tired that you actually hope a mountain lion or black bear will jump out in front of you and gobble you up whole. I have replayed this in my mind over and over. Mountain lion jumps in front of me. I don't move an inch. Not because I am scared, but because I am actually NOT ABLE TO MOVE any more because I am so tired and really I no longer care. I look at the lion, and say, "Here's some mustard. Some salt and pepper. Just do it and put ... me ... out ... of ... my misery!" Of course nothing bad happened to us on this hike, nothing bad has ever happened and chances are nothing bad will ever happen. The worst thing that will happen is that we could continue to get massively sore for a week. Which is actually a good thing because it means I won't have to go to the gym and walk on the treadmill for at least a month. There aren't words that have been created yet that adequately convey the beauty of creation atop the South Rim of Big Bend's Chisos Mountains. Nor are there words to properly describe the grueling experience of making the 13-mile walk up the Pinnacles and down the Laguna Meadows trails. The Boy and I are both sore beyond measure today, so the next question may be: Was it worth it? Take a look at the photo on the right underneath the large photo and you find your answer. I am a lucky lucky man to have a 14-year-old son who finds a good time in a hike and time spent with Dad as well as a boy who can appreciate the peace atop this natural cathedral. The South Rim is not listed as one of the Wonders of the World but it is surely because whoever made up the list has never been here. 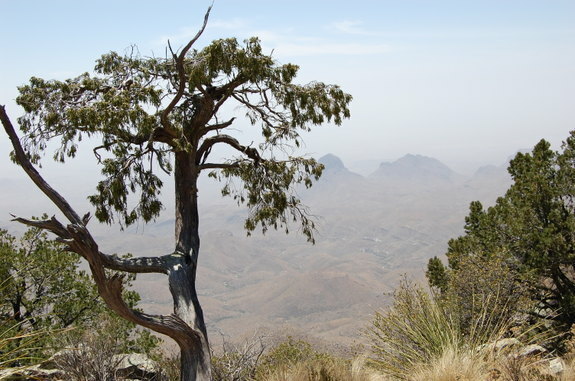 It would qualify not just for the mountain range, but for the views the rim itself offers. 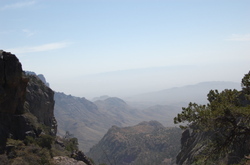 On the way up, a quick peek from the trail as it passes the East rim offered a bonus view amid the haze of the day, something I was not expecting at all: of El Pico, which juts high above its host range, the mighty Sierra del Carmens, in Mexico. 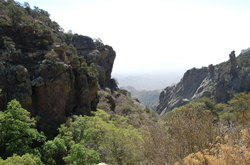 To see the east wall of Juniper Canyon and El Pico in the distance was alone almost worth the walk. And on the way down, the views of Mule Ears and Elephant Tusk and the other lunar-type features of the western part of the park were equally difficult to describe using only words. But the South Rim experience is remarkable for another reason: Standing alone where the mountains end and the desert floor begins far below there is a sound like no other sound I have ever heard: the sound of nothing but wind blowing. Not the wind we hear in Midland everyday, the kind that brashly elbows its way through our lives and town, but here, a soft, flowing, almost mystical sound. 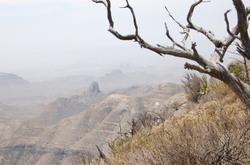 Vegetation at the rim is not excessive and the desert 2,500 feet below certainly isn't causing what we heard. Just sitting and listening to the softness of the breeze and the occasional call of a bird was unlike anything I've ever experienced. It was, quite literally, the sound of total peace. To experience the South Rim, though, you must be in tune mentally and physically. I am far from a seasoned athlete though neither do I lie around on the couch flipping the remote every night, but the South Rim hike is the single hardest and most demanding thing I have ever done in my life. 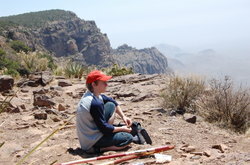 The Boy hiked Guadalupe Peak last fall. I asked him Sunday to compare the rigors of the two. "Guadalupe," he said, "was like a nature walk." I second that. Regardless the degree of difficulty -- "very strenouous" in all assessments I've read -- the view from the top is unbeatable. 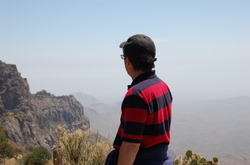 The feeling you get at having summited Guadalupe, it being the highest point in Texas, is one of grand accomplishment, and the pastoral beauty looking southeastward from Mt. 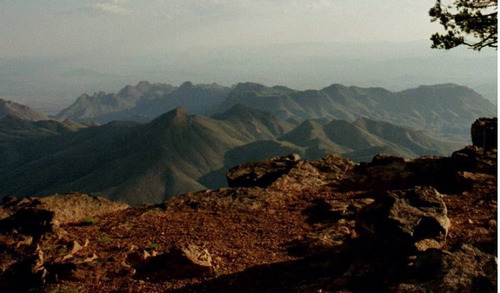 Locke in the Davis Mountains is memorable, too, but standing atop the South Rim ... there is no way to compare it to either. "Hills of forest green where the mountains touch the sky, a dream come true, I'll live there till I die." 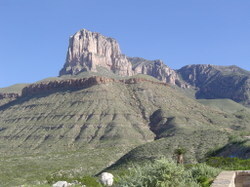 I have heard and read from enough experts and hikers that this is the most spectacular walk in Texas. By this time Saturday, I hope to be able to agree with them all and stand in awe of the beauty. We're a couple of long walks short of a hiking merit badge, and at 12 miles roundtrip, it ought to be a great experience. If someday you get the urge to go wireless-less for a week, might I suggest a two-day retreat here where they don't have technology anyway and the natural beauty makes the gadget-free hours pass by even quicker. It was my and The Boy's intent to hike the El Capitan trail last weekend, but his college-age sis came along for the ride and, naturally, she overslept. And when you hike in the Guadalupes in August, an early start is essential lest you be fried like shrimp on a spit. We also sat and enjoyed the bat flight the night before, last Friday. 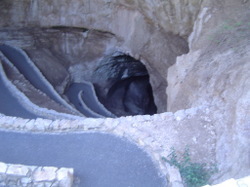 Those suckers can flat fly out of a cave. Between 300,000-500,000 bats fly out of the natural entrance every night at about the same time -- which begs the question: is there like a bat foreman that wears a watch, whistles every night and yells, "Time to fly, people!" ? I mean, how do they know it's time to go? And who told them where to go? Every night, the first place they head is about 10 miles east of the cave to get a drink from the Pecos River (obviously, they are not a discriminating species when it comes to water intake or taste). After their dip into the Pecos somewhere south of Carlsbad, they roam the area until dawn, feasting on 3-5 tons of insects each night. Pass the salt, I'm workin' on a June Bug and it needs a little help tastin' good. When you think about all this bat stuff, it's really sort of a fascinating aspect of nature the way they all work together every night. In fact, I'm surprised Pixar hasn't filmed a bat movie yet. I could just see it: baby bat takes wrong turn and is thought lost forever. After a massive search (requiring an insect fast as all work together), he is later found to be safe, raised by coyotes that roam the Guadalupes. It'll make MILLIONS, I tell ya!